The film city is the brainchild of film producer Ramoji Rao, who wanted to build a studio similar to the ones in Hollywood. On procuring the land, he signed famous art director Nitish Roy to design the complex. According to an executive, the builders kept the land, which at that time consisted of jungles and mountainous terrain, intact, without removing one tree or mountain. A few years after it was built, it was thrown open to the public, who can visit the film sets, theme parks, amusement rides, etc.. The film city also has two hotels inside it, 47 sound stages, and permanent sets ranging from railway stations to temples. ^ a b c d Nathan, Archana (6 February 2018). "At Ramoji Film City in Hyderabad, everything is about show business (and not just for filmmakers)". Retrieved 1 May 2018. ^ a b "Largest film studio". Guinness World Records. ^ "Ramoji Film City - India's Only Thematic Holiday Destination". www.ramojifilmcity.com. Retrieved 3 September 2017. ^ "Guinness World Records certifies Ramoji Film City as the World's Largest Film Studio Complex". Ramoji Film City. Archived from the original on 2 April 2008. Retrieved 8 April 2008. 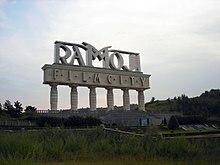 Wikimedia Commons has media related to Ramoji Film City. This page was last edited on 22 April 2019, at 15:53 (UTC).